I’ve been snacking on this soup a lot recently. I’ve surprised myself as I’m not a soup (or smoothie) person, I like solid food (and lots of it) and find that soup never fills me up unless accompanied with a load of bread or has lots of beans or pearl barley in. However, summer is finally here in the UK (albeit not today) – i.e. bikini season – so to play to the holiday vibe, I created this soup using the rainbow vegetables typically associated with Mediterranean to get me through the last few weeks before we trek south for some time out. Thanks to the aubergine, it is pretty filling without being too bulky but best of all, the flavours and herbs are pure summer. If you are lucky enough to have some rosemary growing in your garden, throw in a few sprigs with the roasting vegetables – not least, your kitchen will smell amazing. I use two large roasting tins to fit in all of these veggies. Chop the aubergine into chunks and throw into a large roasting tin with 1-2 tbsps of oil. Cook for 10 minutes before adding the peppers, courgettes and fennel if using. These should be cut to a similar size to the aubergine. Pop in a few rosemary sprigs if you have them to hand. Meanwhile, dice the onions and fry until translucent. Add the chopped garlic before stirring in the roast vegetables and tomatoes. Let everything sizzle together for a few minutes before stirring in the stock. Simmer for 5-10 minutes until the tomatoes are soft. Throw in the basil leaves, juice the lemons and blend until smooth. 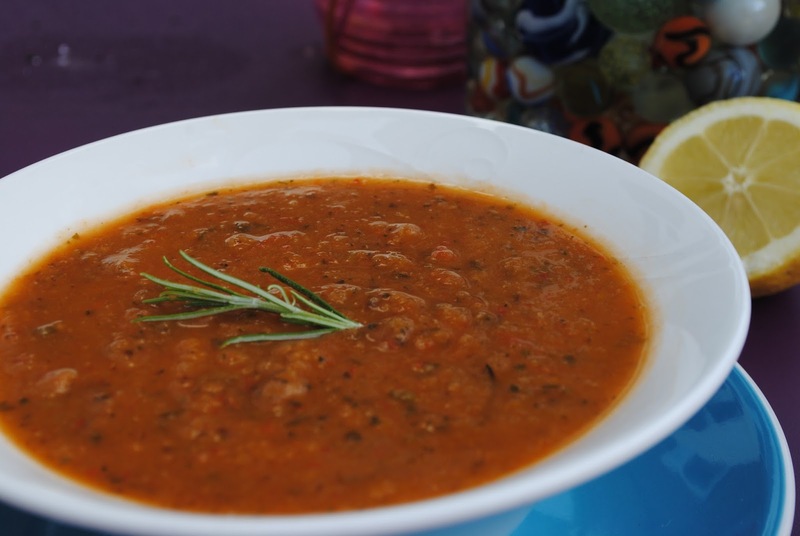 You may want to add some more water depending on how thick you like your soups. Check for salt and add plenty of black pepper before serving. Aubergines? Courgettes? Speakers of English will know these fruits as eggplant and zucchini.